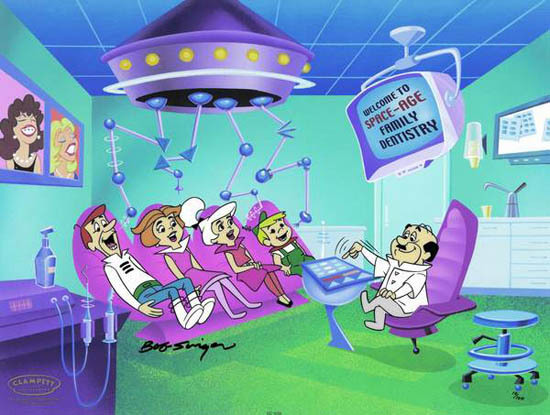 Screenwriters Van Robichaux & Evan Susser Will Tackle 'THE JETSONS'! Screenwriters Van Robichaux & Evan Susser have both been reined in to breathe some life into the long-gestating big screen adaption of Hanna-Barbera's The Jetsons. The duo are best known for their spec script Chewie, a story about the making of Star Wars, told from the perspective of Chewbacca actor Peter Mayhew. That screenplay made the 2011 'Black List' of unproduced screenplays. The previous draft of The Jetsons script was penned by Fanboys scribe Adam F. Goldberg Variety report that Robichaux & Susser are set to pen a new draft & it sounds like they are starting from scratch. Hit the jump for the details. "Part of it is that every couple of years, the genre kind of changes. I really credit Jeff Robinov at Warner Bros. with this. In choosing Christopher Nolan to do Batman, he really exploded the expectations on adapting all these kinds of titles. The pressure is on to really make them the coolest movies, and not the cornball cartoon movies. Every couple years it’s changed what they thought the movie should be and I’m hoping now we’re hitting it at the right time. I’ve never given up on that movie." The popular TV series, which revolves around a family in the year 2062, first had a 24-episode run in the early ’60s which proved so popular in syndication over the following decades that new episodes were produced in the ’80s. The franchise has also yielded made-for-TV specials & films including one animated theatrical feature in 1990. Robert Rodriguez was previously attached to direct, but he’s no longer involved. I'm reading: Screenwriters Van Robichaux & Evan Susser Will Tackle 'THE JETSONS'!Tweet this!